In honor of the 50th anniversary of the groundbreaking Apollo 11 mission, this lavishly illustrated book--featuring stunning photographs and many rarely seen images and documents--tells the incredible story of the first men on the Moon. Acclaimed science author Rod Pyle (Missions to the Moon) returns with a beautiful and insightful book commemorating Apollo 11. First on the Moon offers an exciting behind-the-scenes look at America's journey to the Moon--from the space race to the landing on the Sea of Tranquility to splashdown on Earth and the aftermath. Pyle spent years combing NASA archives and private collections for memorabilia from the mission, and the book includes everything from accessible explanations of the enormous challenges facing NASA to reproductions of original 1969 documents. It also features a number of specially commissioned photocompositions created from NASA Apollo images released in 2015. Many were parts of photomontages taken by the astronauts, and these compositions have now been carefully restored to their originally intended montage formats. With compelling firsthand accounts and a gripping narrative, this gorgeously designed volume fully immerses readers in the Space Age. 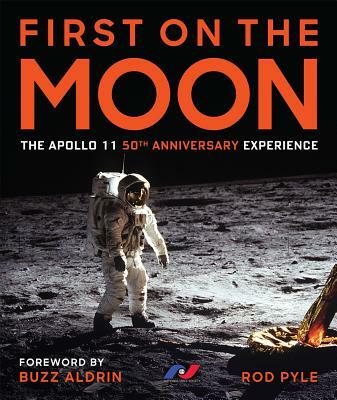 Includes a foreword by Buzz Aldrin, and exclusive interviews with the adult children of the Apollo 11 astronauts. Rod Pyle is a prolific science writer and historian who has written extensively on the US space program, including several Sterling titles (Missions to the Moon, 2009; Blueprint for a Battlestar, 2016). He works as a writer for the NASA Jet Propulsion Laboratory and is a frequent speaker at science and technology conferences. He has researched the Apollo landing extensively, and has created an experiential learning program based on the leadership and management of the Apollo project for the Johnson Space Center. Pyle has written and produced numerous science documentaries, including Modern Marvels: Apollo 11, for the History Channel. He has made numerous media appearances, including for PBS, NPR, and the Washington Post, and is a frequent contributor to Space.com, LiveScience, NBC News Online, Yahoo News, the Huffington Post, and more. Pyle is the senior editor for Ad Astra, a publication of the National Space Society. The National Space Society (NSS) is an independent, nonpartisan, educational, grassroots, non-profit organization dedicated to the creation of a spacefaring civilization. Widely acknowledged as the preeminent citizen's voice on space, NSS has chapters in the United States and around the world. The society also publishes Ad Astra magazine, an award-winning periodical chronicling the most important developments in space, and organizes the annual International Space Development Conference (ISDC) and Space Settlement Summit (SSS). See more at space.nss.org.